What’s the most important club in your bag? The Driver? Surely, nothing beats bombing a long drive past your playing partners. Actually it’s not. The motto of ‘drive for show, putt for dough’ is as true today as ever. If a golfer posts a score close to par, almost half the strokes would have been taken with a putter. As most of your strokes are counted with a putter in your hands, choosing the right one can be the quickest way to cut your handicap. So which putter should you choose? With more design and spec choice than any other club – mallet, blade, length, balance point, weight, head design – the choice can be confusing, so we’ve put together a list of things to consider before buying your new putter. The most common length for a putter is 35” – if you are in need of a shorter or longer shaft, then most traditional length putters range from around 32” to 36”. The best way you can test this is by trying a few putters at different lengths. Once you grab a putter, you need to get in the correct address position. Tilt at the hips, eyes over the ball, hands directly under your shoulders, elbows slightly bent and just touching your rib cage. Now grip the putter with your natural grip. The putter needs to fit this setup. So if you feel you are gripping further down the shaft you will need a shorter putter and likewise, if your grip is too high you need a longer putter. With the correct length putter, the shaft will be in line with your shoulders and weighted correctly. Traditionally there are three types of putter head designs: blade, peripheral-weighted and mallet. The most classic looking putters, very simple, traditionally suited to players with arced putting strokes. Typically, not very forgiving, if you don’t hit the ball out of the centre, so requires a delicate touch. Sometimes called heel-toe weighted. The more technologically advanced sibling of the blade putter, similar look and feel, but feature additional weight in the heel and toe to help aid you slightly with off-centre hits. 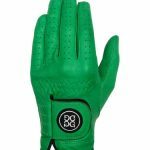 Slightly heavier, with great solid feel preferred by many players, pro and amateur. Arguably the most forgiving type of putter with a lower, deeper centre of gravity increasing the Moment of Inertia (MOI) to reduce spin and improve performance on off-center hits. Mallet putters come in various shapes and sizes, all designed to help align the ball up more accurately and to prevent the club head from twisting, if you fail to hit the ball out of the middle. There are two main types of putter balance: face balanced or toe balanced. If you balance the shaft of a face-balanced putter on your fingers parallel to the ground the face will look up to the sky. This mean the putter will be more inclined to stay straight through your stroke, opening less on the backswing and closing less on the follow-through – this suits the players with a straight-back- straight-through putting stroke. If you balance the shaft of a toe-balanced putter on your fingers, the toe will point to the ground. This mean the putter will be open and close more throughout the stroke – this suits the players with an arc in their putting stroke. Having an arc in your stroke means you will tend to rotate the putter head throughout (similar to a full swing), by opening the putter head on the back stroke, then returning to square at impact, then after impact the face will begin to close. Faces and inserts on putters come in three different types: metal faced, insert faced and groove faced. Metal-faced putters are great for players who need a firm, but controllable feel off the club face. Usually, come in material such as bronze, copper, steel, aluminium, titanium or zinc. Insert-faced putters offer more forgiveness. 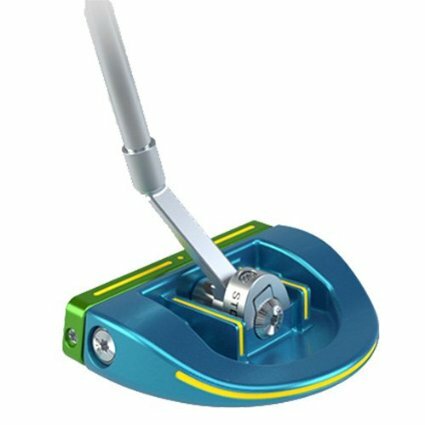 By having a light weight non-metal insert, the weight of the putter can be distributed to the heel and toe, giving you a lot more forgiveness on those off-centre hits. With the non-metal insert, these insert putters tend to feel softer and are preferred by players who use harder cover balls. Groove-faced putters can either be metal or insert faced putters, but they have the added feature of grooves to help keep the ball on line. 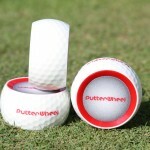 The grooves, at impact grip onto the surface of the golf ball to impart an over-the- top rolling action. Most putters will have steel shafts, to provide a more consistent feel. Where the putter head meets the shaft is called the hosel. There are three main types of shaft position: heel, centred and hosel offset. On Heel-shafted putters, the shaft connects directly to the head at the heel, the end nearest to the golfer. Center-shafted putters meet in the same way as heel-shafted putters but they meet in the center of the head. Choosing this style of shaft is personal preference, some golfers like to have the shaft in the centre to align with the ball and help lead it to the hole during the stroke. Another variation is Hosel offset. This is when the hosel is bent backwards to move the shaft ahead of the putter face to help lead the player’s hands ahead of the golf ball through impact.